Let Us Help You Protect What is Really Most Important to You… Your Family! Our Exclusive Teen Driver Safety Program Can Help You Get Peace of Mind Knowing Your Teen is a Safe Driver. Call 866-869-3335 To Get the Right Teen Driver Insurance Protection For You at the Lowest Cost! Insuring your family with a teen driver can be very costly especially, if your teen causes an accident and you don’t have the right North Carolina Teen Driver Insurance protection should a lawsuit arise. 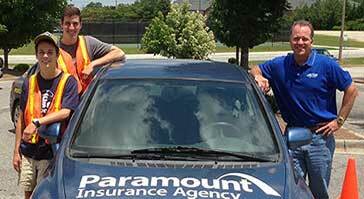 The Paramount Protection Team has helped hundreds of families with teen drivers get the right insurance protection and find ways to save on their premiums. And we can help you too! What could happen if you have the wrong North Carolina Teen Driver Insurance? Now that you have a teen driver in your household, you are 5 times more likely to be sued due to your teen’s mistake that causes a car accident. Without the right liability protection from your NC auto insurance policy, you could be left paying for damages exceeding your liability limits from your auto policy. Assume your teen is driving to school and causes an accident. 2 people are seriously injured and their medical bills total $425,000 plus the total property damage is $56,000. How much will your insurance company pay? Do you have a personal liability umbrella? When you called your agent to add your teen driver, did your agent recommend any changes to your policy? If your teen bumps into a light post in a parking lot and does $898 in damage to your car. Would you turn in this claim? If you are unsure of the answers to any of these questions, we need to talk. You see, now that you have a teen driver, your insurance needs have changed drastically and should be addressed before something happens. We’ll give you the advice you need and can help you find special discounts and ways to reduce your insurance costs without losing important coverage. FAQ- Should I Place a Teen Driver on a Separate Car Insurance Policy?